Advanced self-leveling underlayment technology from Custom Building Products helped accomplish a revolutionary vertical assembly line during the largest concrete pour in Boston’s history. 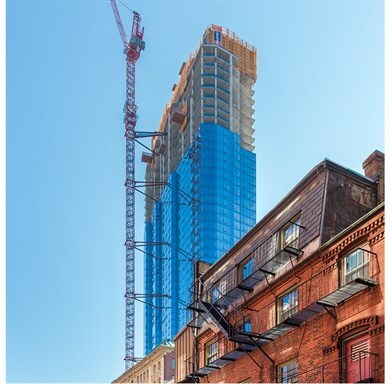 General Contractor Suffolk Construction Co. employed an innovative approach that shaved more than a year off construction on the landmark 60-story, 685-foot tall Millennium Tower. 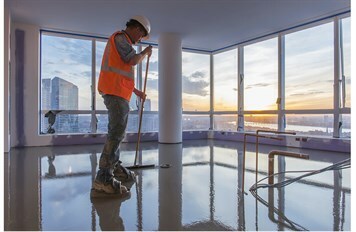 The plan included S&F Concrete completing the concrete pours quickly, within a specified tolerance, followed by self-leveling underlayment pumped to flatten and smooth each floor. Once the building was roughed in, New England Specialty Concrete (NESC) topped one million square feet of concrete with CustomTech® TechLevel™ 150 Premium Calcium Aluminate Based Self-Leveling Underlayment (SLU). NESC pumped the SLU vertically to all 60 stories from a mixer on the ground, producing outstanding outcomes and unheard of speeds. Unlike traditional construction practices, this pioneering process allowed concrete pours to be completed at an astonishing pace of two to three floors per week. The method also created a demanding environment including segregation, poor surface finish and post-placement shrinkage cracks that would radically weaken most SLUs. TechLevel 150 SLU is specifically engineered to handle the rigors of mixing and high pressure pumping without compromising performance. The product’s extreme fluidity and technical properties provided a platform for efficiency and significant cost savings. Concrete was shot blasted and primed prior to receiving the underlayment. Poured from 1/8" to 2.5" deep, without the use of an aggregate, TechLevel 150 dried to a hard, flat, crack-free finished surface. The leveler was moisture-free in 12 hours, ensuring readiness for flooring without the risk of mold generation from moisture trapped in the system. Each 16,000 square foot floor was shotblasted, primed and poured in three days, significantly expediting construction. This included SLU pours of up to 10,000 square feet per shift. TechLevel 150 achieves greater than 4300 psi compressive strength and incorporates low-prep technology. This quick setting underlayment can be applied up to 2" (3.8 cm) thick in one pour and seeks its own level in minutes. TechLevel 150 helps eliminate installation problems such as bond failure, crumbling and staining of resilient flooring caused by the free moisture found in traditional underlayments. This CustomTech system included TechPrime™ A Advanced Acrylic Multi-Surface Primer. TechPrime A is a solvent-free, single-component primer and sealer that prepares both porous and non-porous surfaces. It improves the bond of the underlayment to the subsurface and dries in as little as an hour to speed progression to leveling. Millennium Tower is a skyscraper with 442 luxury condos located in Boston’s historic Downtown Crossing. This project is the most expensive residential development in New England history and was the tallest residential tower in Boston at the time it was designed. Finish materials include natural stone tile, laminate, hardwood and carpet. The CustomTech system is designed for optimum performance with all floor coverings.